There were several factors that affected the initial state of the houses the owners could not prevent. One of them was the economic crisis in the 1930’s following the World War II. After then the German inhabitants were displaced which was the main reason of the house devastation. Before the war there was about 750 inhabitants in Neustadtl and during the after-war settlement there were not many new coming, in year 1950 there were 383 inhabitants. The comers chose brick houses mostly and the other houses were left unoccupied and unmaintained. 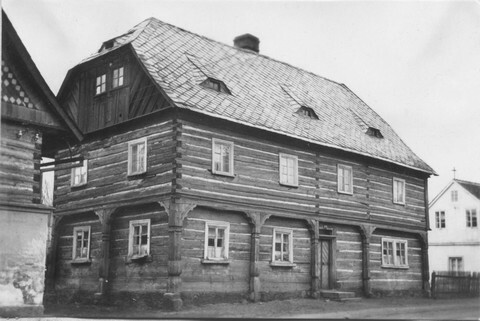 Since the selection of houses was wide due to the reasons mentioned before, the half-timbered houses typical for this frontier area were left without notice. One of these unnoticed houses was the house no. 79 with big historical value. In 1941 the age of the house was estimated at 400 years. After war the local unmaintained housing development became desolated and so the houses were demolished one by one. Today there are new houses, gardens or rubble sites left at some places like for example the place where house no. 79 stood. One fifth of the houses in the village were desolated which had a negative impact on the look of the village, so it was decided the houses will be demolished. Compared to year 1935 when there were 136 houses, at least 35 of them were demolished from the end of World War II to year 1951 which makes unbelievable 25%. The demolition of the desolated houses had to be legalized in some way and thus the confiscated houses were demolished by the instructions of the confiscatory decree no. 180/45 Coll. and by the provision of § 125 of the building code no. 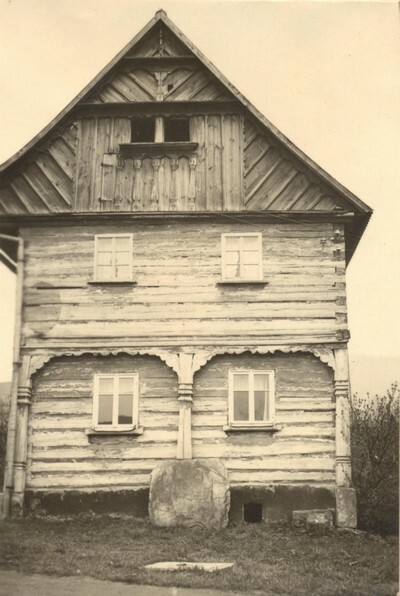 5/1889 for Bohemia to remove structural defects (objects imminent of collapse) which must be removed in public interest or police security: this provision orders abandoning and destroying the objects or their parts or taking actions against potentional risks if the object is imminent of colapse. These circumstances had to be detected and stated in the expert’s opinion. Altough the houses had to be locked and the keys handed to the representative of the National committee during the displacement of the German population, the houses got devastated. In a short time the condition of these houses deteriorated. Empty houses were the target of treasure hunters, illegal source of building material and fuel. The absence of several structural elements can not be explained any other way. Another problem was stealing which was pointed out at the National committee on 5 October 1945. The conditions of the houses were mainly the same. Destroyed roofs, missing windows and doors, torn floors and soaked walls. The houses that used to be a HOME for many generations turned into a heap of bricks, a few cubic meters of fuel wood and building debris for backfill with a price barely more than 1000 crowns. On 18 November 1947 the MNB council decided to make plans for all the houses that had not fallen yet and are about to be demolished. These plans didn’t survive but fortunately several demolition order, where the houses and their building condition are written down in detail survived. The intention of the village was also transfering all demolitions into its possession and gaining insurance of these objects. The demolition applicant had to pay an expert set amount to relevant account before starting the demolition. The profit from the demolitions gained by selling the usable building material and fuel wood was sent to a special account. Purpose of the payment and house numbers had to be written in a special framed place of the paying ticket. Below there’s an example of one demolition assessment and a few pictures of demolished houses. House no. 10 is a two-floor log cabin with a 13,5 × 6,2 ground plan. Behind it there’s added a shed with a 10 × 4 m ground plan. The saddleback roof is covered by slate (50%) and the rest by eternit (fibre cement). The shed which was built next to this house is covered with tar paper. The ground floor contains a living room, a hallway, a storeroom, a barn and a shed. The second floor contains 3 storerooms and a hallways. The ceilings are made of wooden planks or lodge timbers. The floor in the living rooms and in the second floor hallway is wooden and the floor in the first floor hallway is stony. Above the second floor there’s an attic. The ground floor and the second floor are both 2,1 m high and the ridge height of the roof is 3,1 m.
The object is not occupied and its very decrepit condition is left to further decay. The wooden parts of the building are already rotten, the ground floor is digested and the ceiling timbers are sagged and rotten. The windows and doors are flimsy. The object can not be repaired even with a big amount of money. 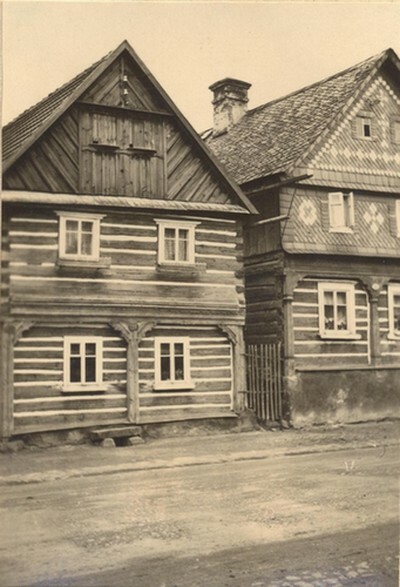 The District National Committee in Ceska Lipa grants on the basis of ‘27th building regulations law’ for Bohemia in conjunction with §109/42, on which norm the committee currently decides in accordance with the provisions of Article 2 and 3 of the Constitutional Law No 30/1945, that this does not contradict in a meaning nor democratic spirit of the Czechoslovak Republic’s constitution and laws, nor it is part of the rules of use completely out of the question, a demolition permission for a house number 10 in Jezve under conditions, which are attached and form a part of this assessment body. The building is dilapidated by its age, its construction is rotten. It is uninhabitable and it can not be brought into usable condition. You can appeal against this decision within 15 days; this period will start a day after delivery, to the State National Committee in Prague, lodging it at the District National Committee in the Ceska Lipa. From 1945 to 1951 these houses were demolished in Jezve: no. 4, 9, 10, 12, 33, 34, 35, 41, 42, 43, 47, 48, 51, 55, 66, 67, 70, 73, 75, 76, 77, 79, 81, 91, 92, 96, 98, 101, 115, 117, 120, 124, 125, 126 and 128.